Power-operated elements provide more control and a wide range of operations within a workholding system. Once adjusted, each product consistently clamps or holds. Powered work supports automatically adjust to minor workpiece irregularities. In addition, power workholding systems can operate multiple clamps and other devices in sequence to accomplish a multistep fixturing task. Power Workholding Components greatly reduce loading times and are particularly effective for high-volume runs. Although initial costs are higher than with mechanical workholding, self-contained hydraulic workholding products are more efficient because fewer clamps (and accompanying personnel to operate them) are required. By replacing repetitive manual clamping, power workholders reduce operator fatigue. They allow remote control of inaccessible fixturing. Most systems also feature back-up controls for added safety in case of power failure. Since power workholders are controlled by a power source, the strength and fatigue of the operator have no effect on clamping force. Once set, force remains constant. And when more or less force is required for the next setup, the same clamps or positioners can beadjusted for those specific conditions. When operators have less physical labor in clamping and unclamping, they can run more machines and produce more. More workpieces can be loaded on fixtures for a given production cycle, which lengthens individual steps and requires less attention from the operator. 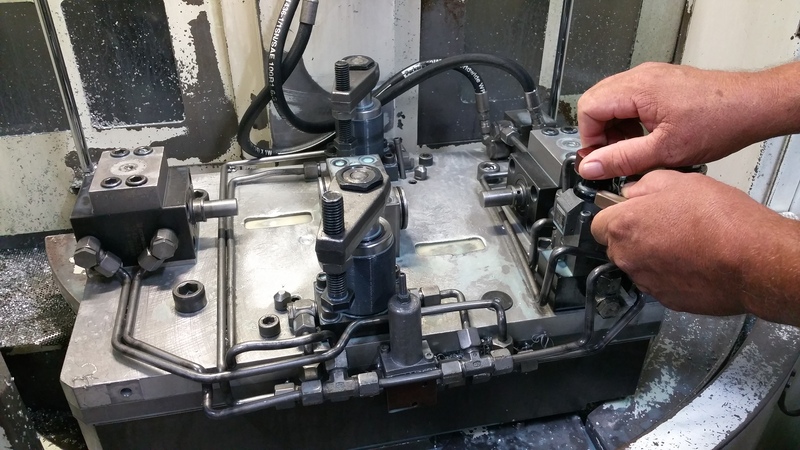 Many types of power workholding can be performed by less-skilled workers. Versatile power workholding does not require design specialists. The same tool designer who designs the workholder can also design the clamping system. With their small size, Roemheld components are easy to locate. Standard fittings connect easily and ensure positive sealing. Roemheld power components are designed to fit easily on fixtures. Since they function well at fluid pressures up to 7500 psi, their smaller design can still provide high clamping forces. Small power clamps often allow loading more workpieces on a fixture because the clamps can be positioned closer together. A result is increased productivity through more parts per cycle. Catalog of Workholding Clamps, Hydraulic Work Supports, Hydraulic Power Units, Machine Vises, Valves and Accessories. Everything you may need to design and build a hydraulic fixture.